In mid April my former beading teacher, Donna, and I met inMontgomery, Alabama. We both used to bead together at Planet Bead in Hillsboro, Oregon. In mid April my former beading teacher, Donna, and I met in Montgomery, Alabama. We both used to bead together at Planet Bead in Hillsboro, Oregon. Now she lives in Georgia and I am in NW Florida. Our intent was to spend three days beading (using seed beads to make jewelry) and to check out Montgomery’s only bead store, the High Strung Bead Shoppe. There is nothing more inspirational than watching someone who is a professional put together jewelry that looks rich with colors, sparkle and complexity. While Donna made a variation of Bead and Button’s “Honeycomb Bangle” from the April, 2011 issue, I worked on an easy project I had postponed for years: “Take It Easy”, from Bead and Button’s April 2006 issue. My project isn’t finished because I ran out of crystal Fireline. But in a matter of minutes it went from a drab two-drop peyote band to stunning. When I complete it I’ll take a picture and post it here. Over those three days I also started a project from The Art and Elegance of Beadweaving by Carol Wilcox Wells, called “Choker With a Secret”. Compared to my talented friend I’m color challenged. When it comes to picking out color combinations some people just have a knack for picking out colors that pop. Mine usually fizzle. But actually this twisted herringbone project was looking better and better with the use of both Rainbow Dark Green seed beads and Metallic Raspberry delicas. Then just before finishing the last few inches I ran out of delicas. Another project put aside. My Fire Mountain Gem order is getting bigger. There were a couple of other bead projects I started and almost finished when I returned home. Finally I looked in my project box and saw a package of size 6 Dark Indigo AB2X Swarovski bicones wrapped with various vials of dark delicas. 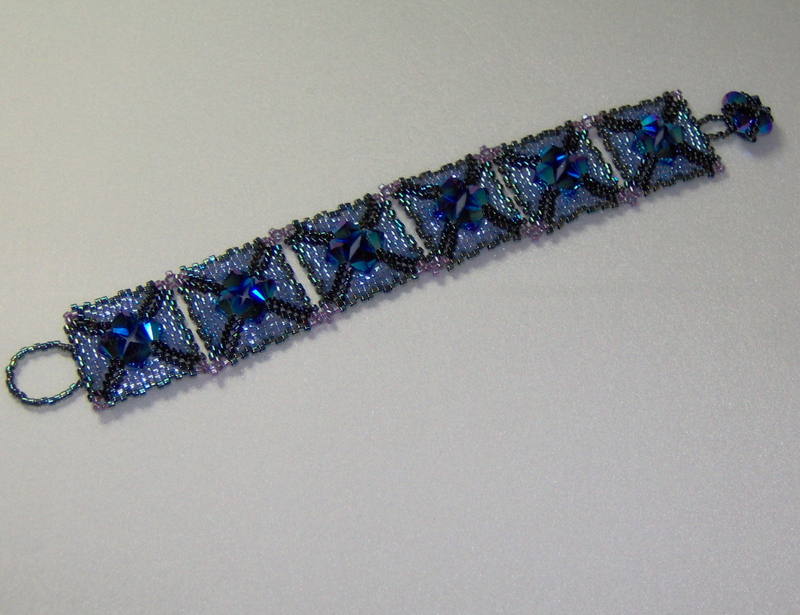 The associated project is from Beadwork magazine’s February/March issue, “Camelot Cross Bracelet” by Carole Ohl. This turned into a beautiful, easy to make, sparkling bracelet that fits perfectly and hugs my wrist. When I finished the six squares and was putting them together there were images of more Camelot Cross bracelets I want to bead in various color combinations. Maybe a seventh square could be made and a hidden snap sewed on to close the ends? Thanks so much for Carole Ohl’s imagination and I hope to find more of her projects online or in Beadwork magazine. This entry was posted in Beading, Retirement Life and tagged Beadwork, Crafts, jewelry, Swarovski. Bookmark the permalink. Gotta love the crafting and pets blogs 🙂 That bracelet is adorable!! Great job! The dogs would be happy if I didn’t bead so much. But it is a nice break from training them or throwing the ball over and over. This was such an easy project. I’m thinking red Swarovki’s next time and black accent beads. Or?